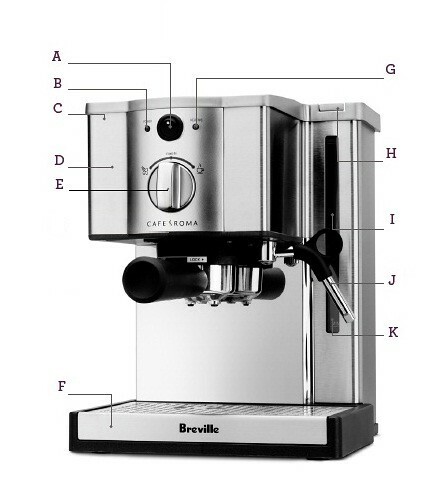 The Breville Café Roma Espresso Machine — It brings out the inner barista. Thermo-block heating system extracts espresso at the perfect temperature. 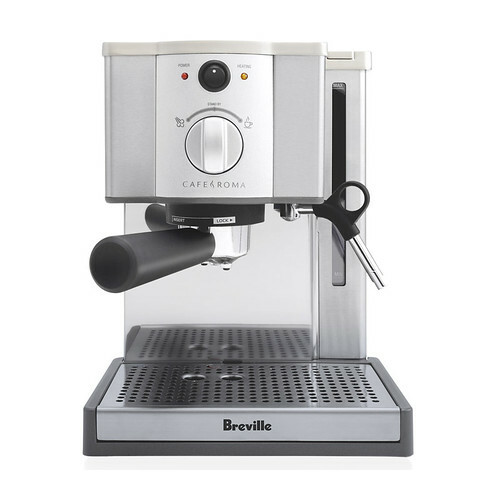 A full 15 bars of pressure maximizes créma for a rich, barista-style aroma and taste. Effortless frothing and foaming. A. Power On/Off Switch. B. 'Power On' Light (red) - illuminates when the machine is turned on. C. 15 Bar Pump. D. Thermoblock Heating System. E. Selector Control - for espresso and steam. F. Removable Drip Tray and Grid. G. 'HEATING' Light (orange) - Illuminates to indicate that the machine is heating and will turn off when the correct temperature is reached. This light will cycle on and off during operation to indicate that the machine is maintaining the correct temperature. H. Removable 40 fl.oz (1.2 liter) Water Tank. I Water Level Indicator. J. Steam Wand. K. External Water Window.